Black Tourmaline that has grown through Quartz. The "rods" of Tourmaline are sometimes very distinctive and often easily seen. Tourmaline is a stone that has been revered over centuries by the cultures of ancient India and Africa, as well as the Native Americans and the Australian Aboriginal tribes. Tourmalinated Quartz is said to help in treating arthritis, dyslexia and heart disease. Tourmalinated Quartz helps to reduce fear, particularly if it is related to bad dreams or nightmares. It instils both self confidence and a positive attitude towards life. 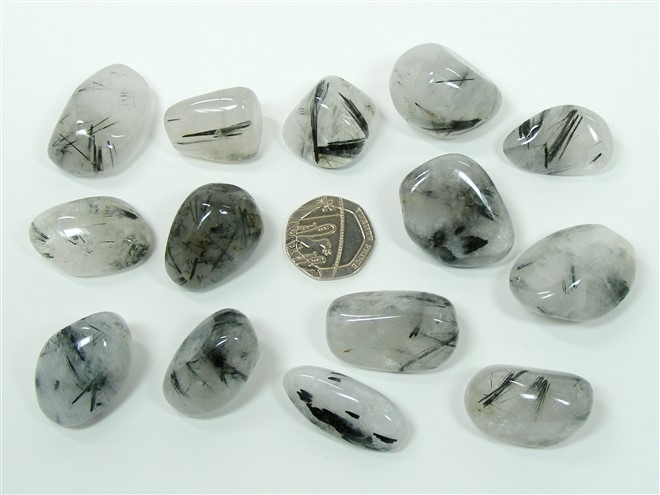 Tourmalinated Quartz is an excellent protective and strengthening stone and one which can protect the wearer or carrier from being harmed by the negative energy of another. It also provides protection from spells and ill-wishing and from those who do not understand or respect the love of the universe.